Since it’s also November and I’m trying to remind my kids that it’s the season of gratitude, we’ve been doing a few activities that focus on what we have instead of what we want. Today, we tried this printable activity. I asked Little J what are some of the things he was thankful for and then we wrote them in the right spot with the letter it started with. Little J will also be helping me teach the rest of the family what it means to be thankful and what some of his blessing are. The rest of the family will then fill out their own ABC printable – kind of like Scattegories, but all the letters will be played at once. We will compare and see if we can get the entire alphabet filled out together. 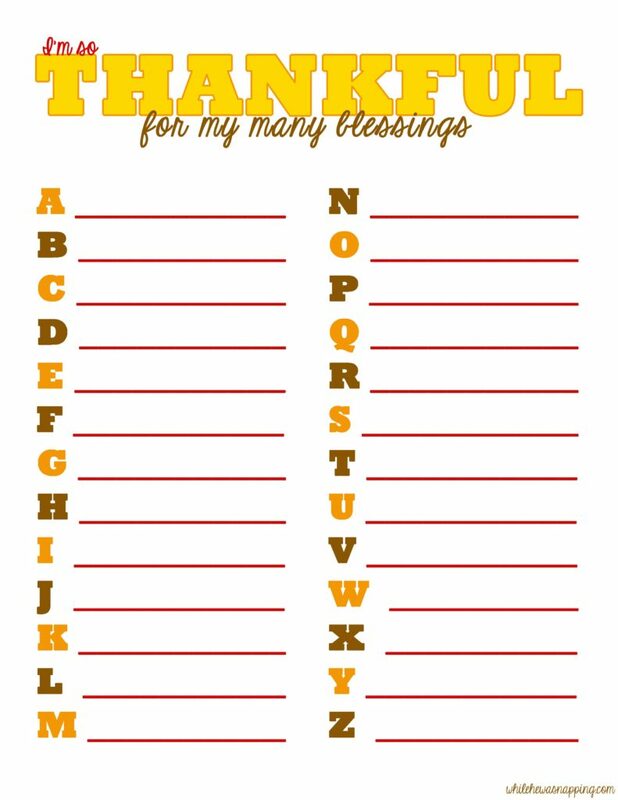 If you’d like to try and fill out your own alphabet of blessings, you can print your own high resolution copy of the Thankful for My Many Blessings ABC Printable when you click on the photo above. A download window will open and you can save the file to your computer. After you save it, you can print it on your home printer. And here’s the legal shtuff: Feel free to print as many copies as you like, but please pin the image on this page and give your friends and families this link address – not the download page. This image is free for personal, classroom or group use. No commercial use for profit is allowed. Do not change or modify this image in part or in whole. Use it, don’t abuse it. Thanks! Hey! I LOVE this idea. I am always trying to find ways to teach my kids gratitude. It’s not as easy as it sounds 🙂 I am printing this and doing it. I think they would really like it. My oldest two are just now starting to learn their letters and reading, so this will be fun. Thanks so much! Have a great week. And my middle dude is resisting any kind of learning – particularly the ABC’s – and I’m having to try to slip it into our routine without him noticing. Hahaha!